I-AM have worked with the founders of Chilango on every creative aspect of their business for the last six years. 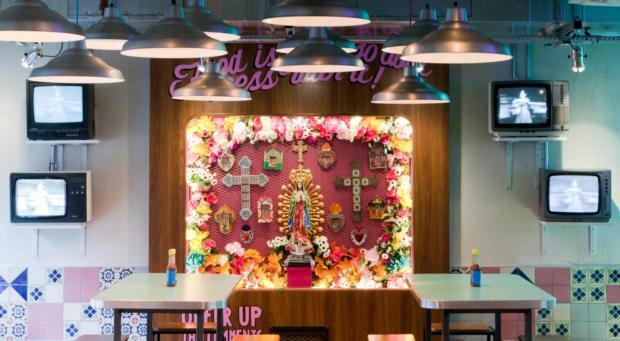 A sense of fun and a sprinkling of Latin lust for life has proven a recipe for success; Chilango now have six successful UK sites, the latest of which has just opened on London’s Leather Lane. A lighter, fresher direction was chosen by I-AM for this iteration of the Chilango experience, taking inspiration from the washed-out pastel palette of urban Mexico City. Alongside the now-characteristic Chilango graffiti, a key feature of the interior concept is the use of vintage television sets displaying Mexican telenovelas and live wrestling. In this way, moving images rather than bright colours are used to bring out the vibrancy of modern-day Mexico. Chilango celebrated the opening of their latest restaurant by offering free burritos for all and despite the rain (and thanks to some brightly coloured umbrellas) the queue stretched around the block for most of the day. Why not head down and check it out for yourself? If you want to speak to our experts about the services we offer, get in touch! 18/06 - I-AM & Keatons Running Team: Please sponsor Us!